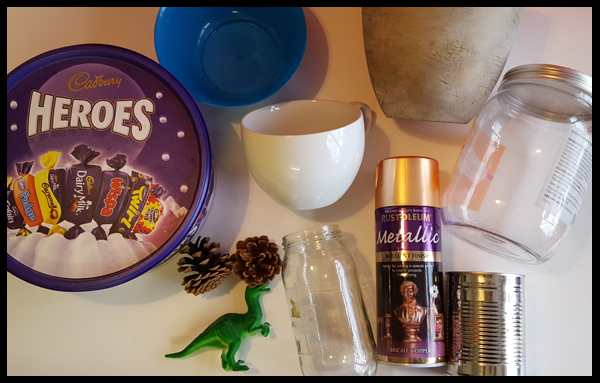 With Christmas well and truly tucked away back in the loft, I was left with various tubs, jars and tins in the recycling bin, just waiting to be given a new lease of life. 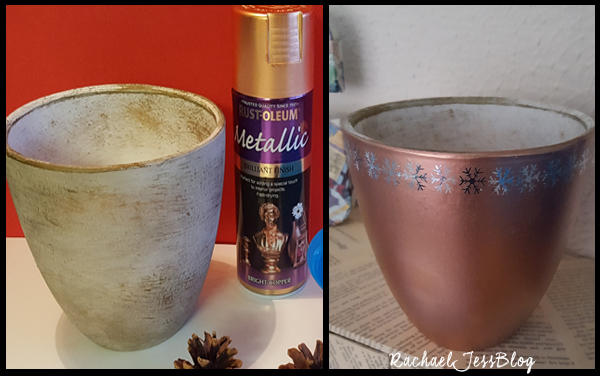 Not all the items above got sprayed with my fabulous Metallic Copper paint, as I plan to decoupage the Heroes tin and the plastic blue bowl is not the right surface, but I was so pleased with how well the paint went on to my glass jars! 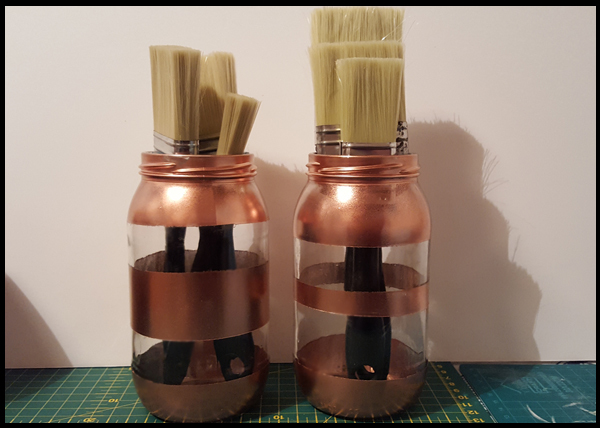 I'm liking the middle step and if the tape had gone on more smoothly I might have left the jars as they were! 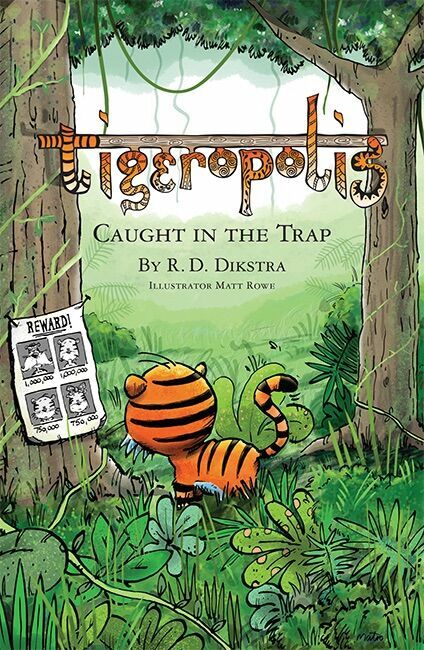 Good to know for future projects. 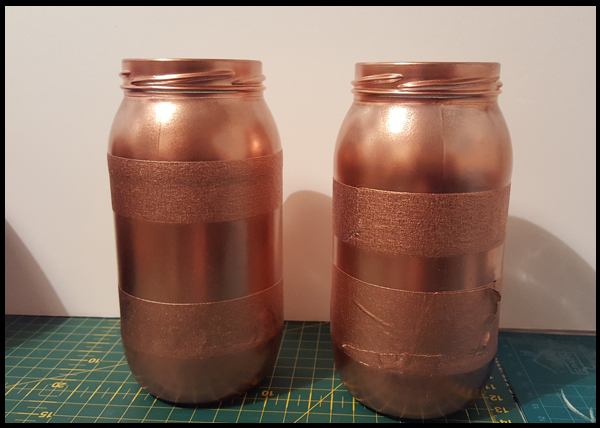 Some very quick and easy jars. 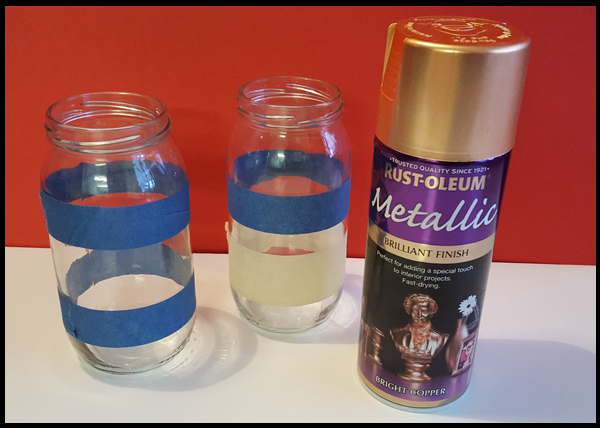 The few materials used were Rust-oleum spray, marking tape, empty glass jars and a little bit of patience. But my favourite piece that I decorated with leftover Christmas recycling items was the sweetie jar! 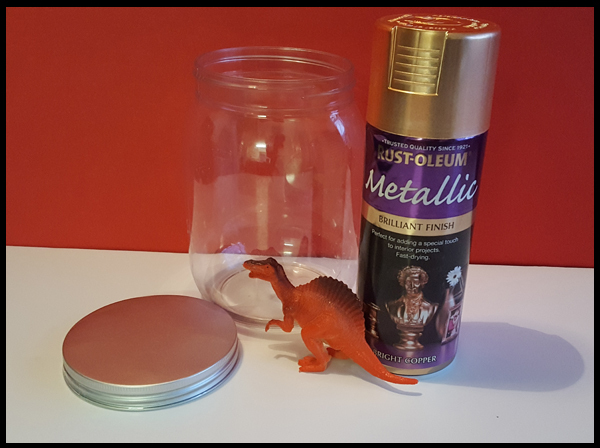 This is a great size plastic jar, which can hold quite a few smaller dinosaurs that usually get lost at the bottom of the toy boxes. 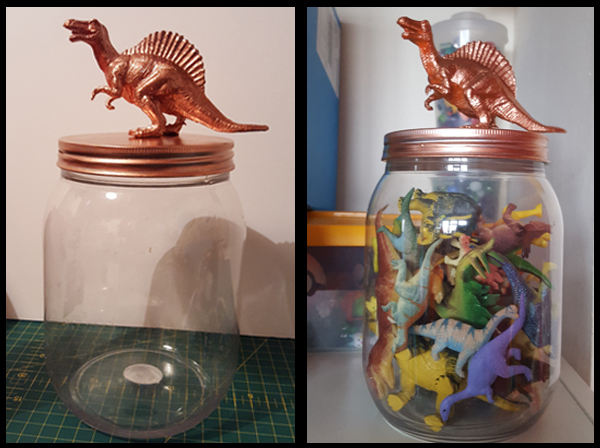 A quick transformation to the lid and a purchased dino from the local charity shop... (as my son knows exactly how many he has, and would not take kindly to me spray painting one!! 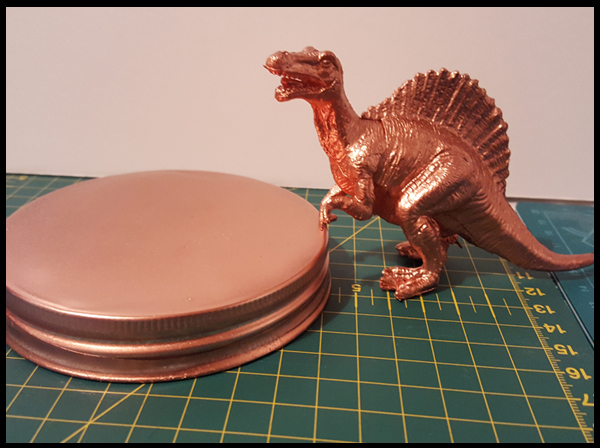 ), and we have a new storage pot. I also touched up some pine cones and an old plant pot and the transformation is truly stunning. 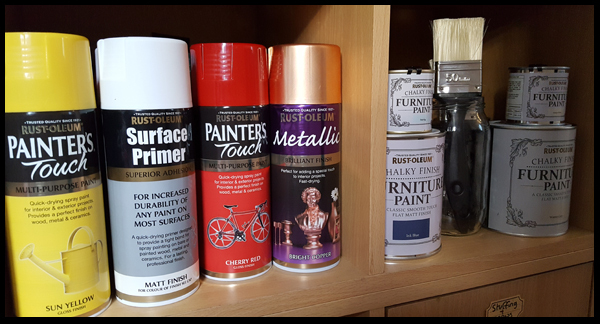 I would recommend having a look around your home and see what needs touching up and just give it a go or, pop down to your local charity shop and have a good root around in the household section and visualise the products with a new lick of paint - and experiment. 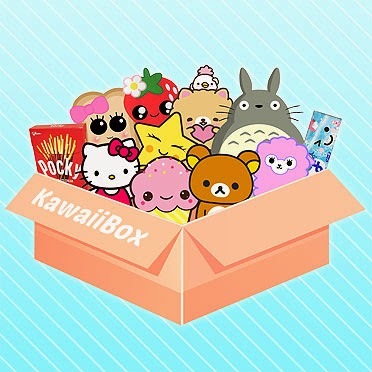 You'll be surprised with how lovely your results will be.